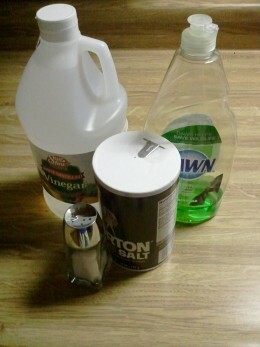 Salt & Vinegar - Mix 1 & 1/2 cups of table salt into 1 gallon of household vinegar. (*note, I also added a squeeze of Dawn). Mix thoroughly so all the salt dissolves. Undissolved salt will settle on the bottom of the sprayer and may even plug the sprayer nozzle. Apply by spraying onto target weeds. Salt is very effective in tandem with vinegar, but salt solutions can cause damage by soaking into the soil and spreading into non-target areas and plants. Be very cautious and use sparingly when applying salt solutions since non-target plants and lawns in the direct vicinity can easily be killed. Salt remains in the soil for a while and may cause lingering problems in other plants. Salt is best used against weeds in sidewalks, patios, and other hard surfaces. Dish Detergent & Vinegar - Mix vinegar with a few squirts of liquid dish detergent into a sprayer or small spray bottle.Apply the mixture by spraying during the sunniest and warmest part of the day. Hot summer days provide the best results because the soap will dry into a film on foliage while helping lock in the vinegar. Reapplying of mixtures is usually necessary, especially against resilient weeds. Such mixtures do not remain active for very long which allows new weeds to emerge. Spray new weeds as soon as possible.